How bittersweet to celebrate the high school graduations of two young men I've know since they were small children. I am so proud of them and so happy that they have purpose and direction in their lives. Still, I'm a little sad that soon they'll be away at college and I won't be seeing them as often. I wanted to bring more than a card to their graduation parties, so I made up these little gift bags from old jeans and put in some items that I thought they'd need when away from home: Bandaids and non-aspirin pain reliever, Febreeze and Tide stain remover, nail clippers and Q-tips. My solution: a picture frame with a cute saying inserted. 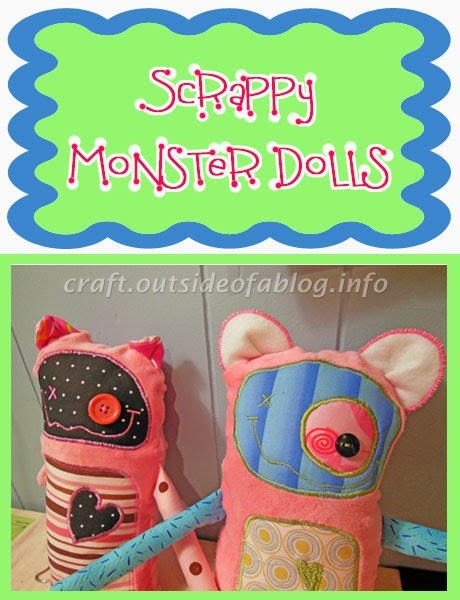 Scrappy Monster Dolls: The Fun! Several weeks ago, I saw these cute monster dolls on Pinterest, and knew I'd have to make some myself. It was such a fun way to use up some of my scraps! 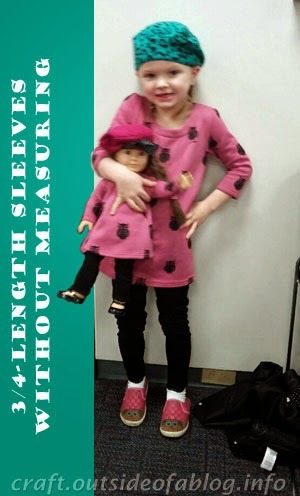 A girl and her doll, how they love to dress alike! If you saw the Easy Tank Top Nightgown, you know that pink is the color of choice. This pink fabric is a cozy sweatshirt fleece, perfect to pair with leggings. 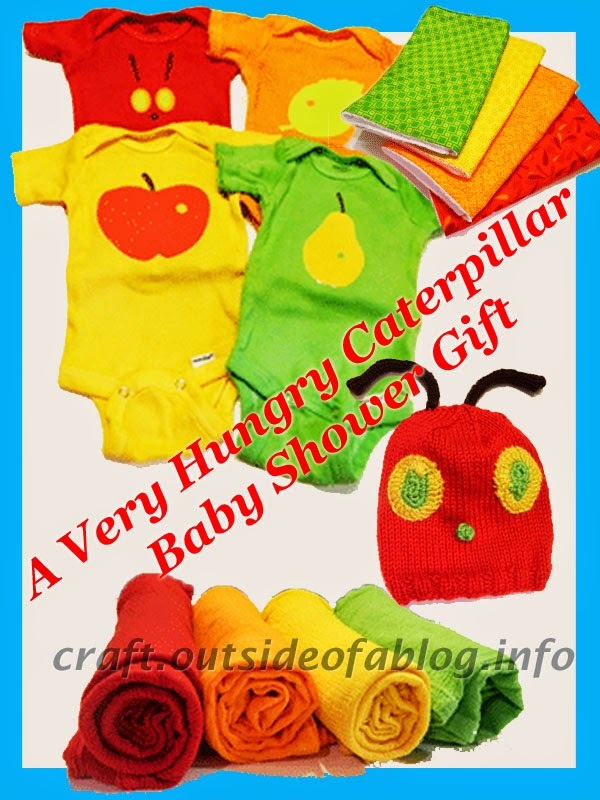 Are you looking for a quick idea for Easter baskets or birthday party favors? Maybe, like me, you need a way to make crayons available for small children during worship, with a reminder to return them after use. 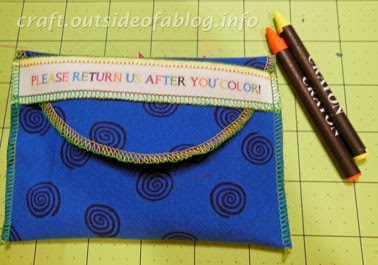 These simple to sew crayon pouches look pretty cute and are useful, too! Let me tell you how I made them. This girl loves a tank top! She's been asking her mom every day when the weather will be warm enough for tank tops and shorts! At least she has this tank top nightgown, and look how springy it is in this pink knit! There's more than one way to put in an elastic waistband, and this is my favorite. Why? It's quick and easy. It looks neat. The elastic will not twist. 1. Cut elastic 2-3" shorter than the waist measurement. I usually cut mine 3 inches shorter. Overlap the ends of the elastic about 1/2 inch and stitch securely. Divide the circle into quarters and mark with pins. I like to start with a pin just to one side of the overlap, and place that at the back of the garment. Placing the mark to the side prevents the bulk of the overlap from lying on top of the bulk of the back seam. 2. Divide the garment top in quarters and mark with pins. 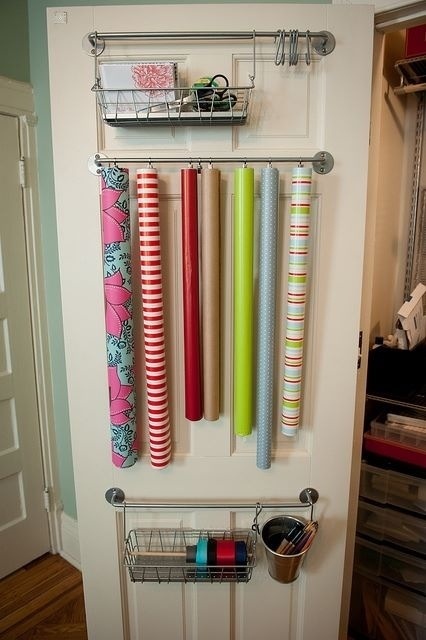 I came across this idea for storing wrapping paper rolls on Pinterest. It took me a while to track down the original post for how the paper rolls were hung on the rod. Of course, it's not only well organized, but really cute, helped by the pretty paper. I focused on the well organized part, because what I wanted to organize isn't all that pretty: interfacing, wonder under, etc. I had been storing these sewing supplies by rolling them on empty gift wrap tubes. I stored the rolls in a tall waste basket. There were a couple of problems with that. First, I was also storing other rolled-up things in that waste basket. There were rolls of wrapping paper, contact paper, and kraft paper, along with a couple of other miscellaneous items. I dealt with that by putting all those things where they belonged and/or in new storage locations. The other problem was finding what I wanted—or not finding what I wanted! I would have to pull each roll out and try to figure out what was on it. Not all the rolls are the same length, so some things would get lost at the bottom of the "barrel". This is where the hanging storage came in! 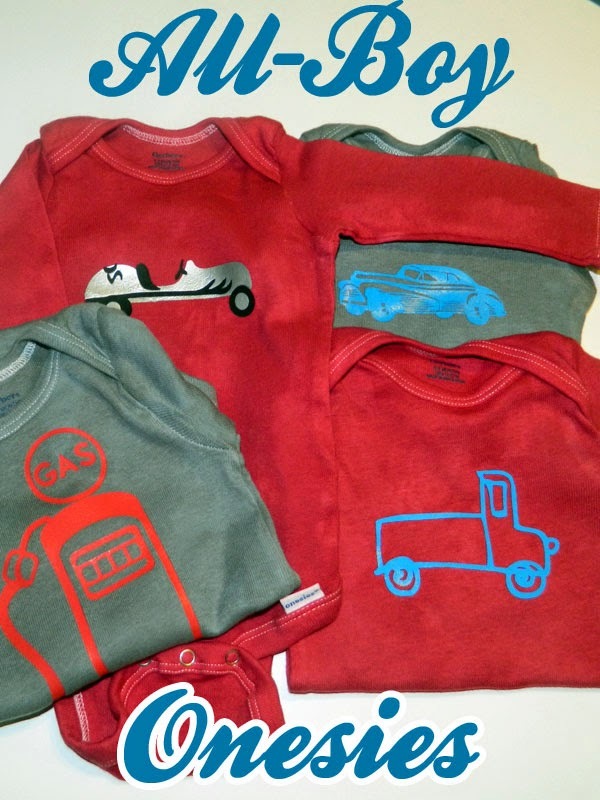 I decided to celebrate the new year by sewing—anything I wanted. It took me a while to decide, but I had unearthed a pattern for a scrap bag for a sewing table (Kwik Sew #3886) when I was doing some cleaning and organizing the other day. That was exactly the right thing! I had made a curtain for the window in my sewing corner, and thought I'd like to use the same fabric for this.